“Earth Mother, Mother Goddess, Great Goddess, Terra Mater… and Gaia. In the Greek pantheon, this magnificent being was Earth personified as a goddess. Daughter of Chaos, she was the mother and wife of Uranus (heaven). It is her body that we walk upon ever day, and the substance of our own bodies is the substance of hers. It is from Gaia that we receive everything we need for survival, which she provides for us abundantly, nurturing our body, mind and soul. She nurtures our bodies by offering the fruit of the trees, the greens from the Earth and the air that we breathe. She nurtures our minds through her awesome physical and dynamic beauty and, as depicted in this card, by the amazing colourfulness and diversity of the world she is constantly creating and re-creating. She nurtures our souls by caressing us with her blessings each day and challenging us to be better humans through her response to our attentions and intentions. Receiving can be a scared act if your intention is to honour Spirit. It is as holy as giving when performed with a humble and open heart. 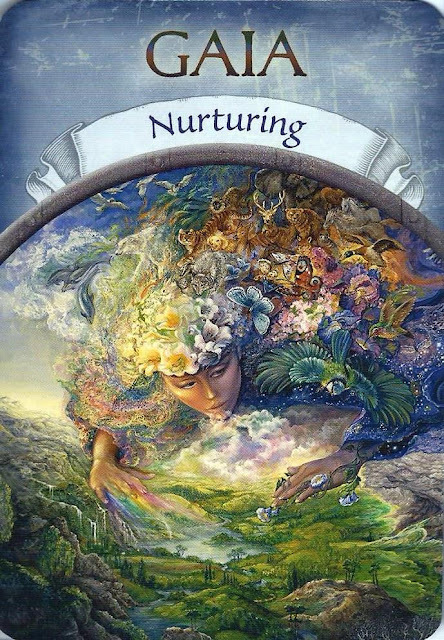 This is even truer when receiving much needed nurturing, so let others give to you. It may be a stretch to do so at times because of childhood conditioning, but that habit can be overcome. Your wounds can be healed. One way to achieve this is to nurture yourself, and allow others to nurture you.